Miliband stated: "Yesterday's unilateral attempt to redraw the map marks a moment of real significance. It is not just the end of the post-cold war period of growing geopolitical calm in and around Europe. It is also the moment when countries are required to set out where they stand on the significant issues of nationhood and international law ... Russia is not yet reconciled to the new map of this region." Well the EU and the US did pretty much what Russia has done - diplomatically - when they recognised the unilateral declaration of independence of Kosovo. That redrew Serbia's borders. Nothing from the Guardian about that. How did they think Russia would react? Now the Russian's do the same sort of thing and all of a sudden their are howls of outrage from the West. The big Western media channels are politically aligned to the views of their governments and don't seem to take any account of any other perspective. the mainly ethnic Russian peninsula, the Crimea, and its naval base at Sevastopol, which is leased from Ukraine by the Russian Black Sea fleet. Ukraine and Moldova, which also has a pro-Russian breakaway region, Transnistria, could become the next targets of a newly assertive Russia. These are the places to watch now. It was in a region near (or in) Moldova that triggered the Crimean War. The Russians still have units in Georgia (outside of the two "independent" regions) - as long as those military positions are beyond the borders Russia ought to face criticism - and will be met with US support for Georgia. But to present an explanation of why this occured and to leave out Kosovo is negligent. The BBC is just as bad: Did not the recognition of Kosovo by those Western countries violate the integrity and sovereignty of Serbia? Who cares!? - that's what they thought then when they did it - they are the one's who tore up the international rule book to aid their cause - and screw Russia and screw Serbia. Well now the boot's on the other foot and suddenly Georgia is the new Belgium (in a WWI sense). Al Jazeera: The US Coast Guard. Georgia's coast is now the US coast? OK, for the record, I supported NATO's intervention in Kosovo because there was a severe humanitarian crisis involving Serbian authorities "ethnically clensing" the province of its Albanian population - involving displacement, killing and a huge refugee situation and the potential destabilisation of its neighbour (Macedonia). UN authorised peacekeepers was a good idea too. 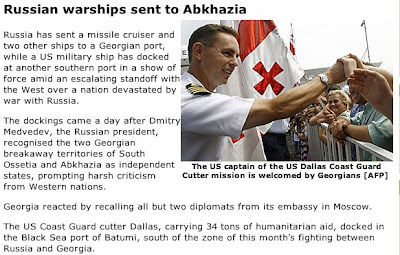 It was a bad idea, however, for the Western powers to encourage them to declare independence and a worse idea to recognise that independence - it was an opportunistic move, it set an unfeasible precedent - one Russia has now used in Georgia. The government in Serbia has changed for the better - the original reason for severing off Kosovo has now gone. The bleating from the British and others about re-drawing the map and international law is completely hollow because of how they have dealt with Kosovo. Right on Tim. I was thinking the same thing re: Kosovo. The US and the UK, in particular, are hypocritical in the extreme....having jointly invaded Iraq employing deceitful pretexts. 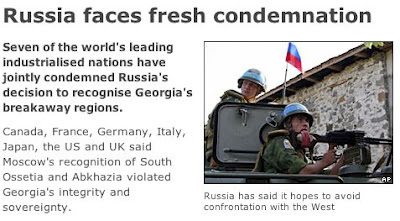 At least Russia can claim they were acting in the interests of ethnic Russians marooned in Georgia after the breakup of the Soviet Union. How many Brits and Americans were marooned in Iraq requiring "saving"? The hypocrisy on Georgia is a mountain high and a mile wide. Hypocrisy-a-rama, man. Milliband had some breath-taking things to say when he visited the Ukraine. You keep saying in these comments (and in your posts on your blog) that these guys are ethnic Russians. I thought they were their own ethnic group - like the Chenchens and the Inguish etc. The Ossetians are - I'm not sure about the Abkhazians.